It's a shame that "wail" -- à la Wayne's World -- never entered popular vernacular. Sure, babies and banshees are constantly wailing, but never in a good way. Bob Marley's band wailed, though on a different plain entirely. Despite always wanting to use the word, there needed to be exactly the right moment. 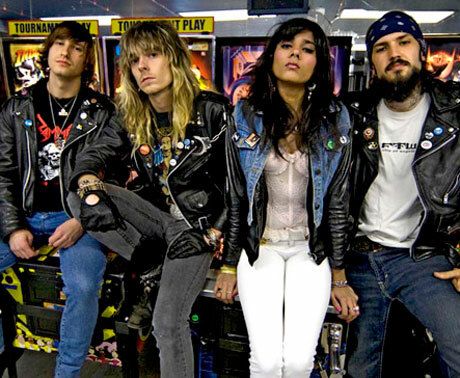 So, without further ado: like Crucial Taunt, Toronto's Diemonds really do wail. The conceit -- glam/hair metal revival -- is a tricky line to toe, constantly careening toward parody, but Diemonds were dead serious and the commitment worked as they blazed through an afternoon half-pipe set. It didn't hurt that frontwoman Priya Panda has the perfect stadium-metal DNA: big voice, fantastic snarl and leather pants. And boy, does she ever wail.